An editor says his newspaper will not be deterred from reporting on an illegal bonfire despite a series of “intimidating messages” at the site. 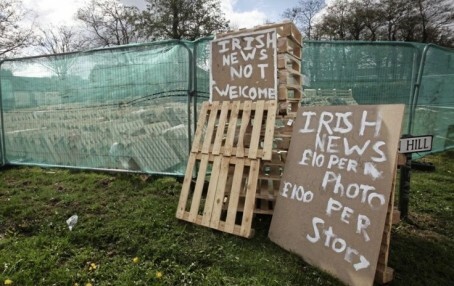 Signage at a loyalist bonfire site in Belfast has appeared stating that the Irish News is “not welcome”, and will be “charged” £10 to take a photograph or £100 “per story”. The News, which is traditionally seen as an Irish nationalist paper, revealed last month that workers from Northern Ireland’s Department for Infrastructure were “approached” and told to leave the area after they had previously removed tree cuttings and old furniture from the fire. Bonfires have traditionally been lit by members of the British loyalist community in Northern Ireland on 11 July, the night before the Battle of the Boyne is commemorated. The News says safety concerns have been raised about this particular fire in the past, including police previously cordoning off the road due to fears it could collapse. In a piece about the signs’ appearance at the site, the News described itself as having been “banned” from the area. Editor Noel Doran told HTFP: “We understand all the sensitivities surrounding loyalist celebrations, but this is a completely illegal bonfire which has been under construction on one of Belfast’s busiest roads for some weeks and is intended to remain in place until it is set alight on the eve of the 12 July parades.